"Waianapanapa Black Sand Beach, Maui." 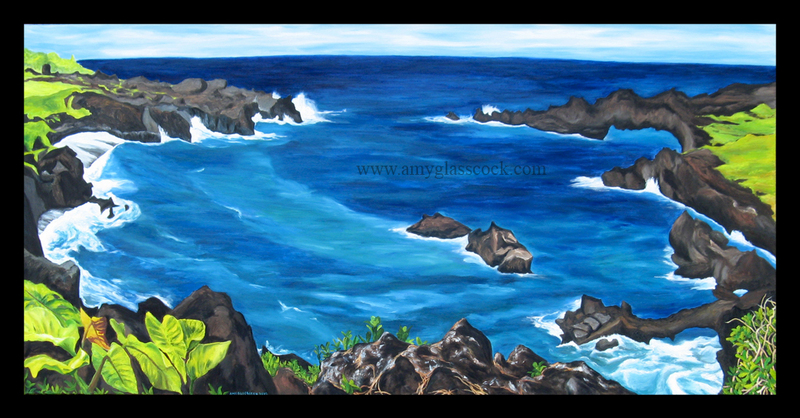 I based this painting on a black sand beach named Waianapanapa that I visited in Maui. It is at the end of the dangerous and curvy Hana Highway. The lava is left over from the eruption that created the island. And at this beach you can literally see how this lumpy liquid rock spilled into the ocean. 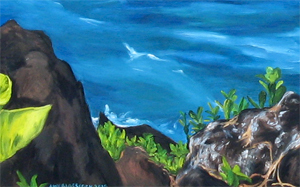 It's dark black color against the shockingly blue-green water and bright white crashing waves was quite a beautiful site and thus I had to try painting it. In the end I really enjoyed capturing it's curvy lines and shocking contrasts. Well done God for making such a beautiful place!